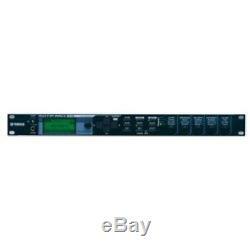 YAMAHA Yamaha MOTIF XS series sound module MOTIF-RACK XS. 1152 Voice + 65 wide range of voice selection of genuine oriented drum kit Powerful arpeggio function with total of 6,633 types that can play 4 types at the same time Realtime edit of sound during performance / recording with 5 control knobs Speedy edit all settings with computer's MOTIF-RACK XS Editor Completely integrated with the well-established Cubase series as music production software. MOTIF - RACK XS is a sound module of the MOTIF XS series which has earned high praise from keyboard players, engineers, composers all over the world. High quality sound equivalent to MOTIF XS and numerous functions are condensed into 1 U rack type. If it may not understand, please ask a question always. · We do not mark merchandise values below value or mark items as "gifts" - US and International government regulations prohibit such behavior. The item "YAMAHA Yamaha MOTIF XS series sound module MOTIF-RACK XS from japan" is in sale since Monday, January 22, 2018. This item is in the category "Musical Instruments & Gear\Pro Audio Equipment\Synthesizers". The seller is "yosh-set" and is located in KYOTO.